Robert C. Mohler’s occupation, machinist-mechanical engineer, and his desire to see the world brought him to many lands during his long career in the engineering and mining field. His early education in West Virginia consisted of high school, which was later supplemented with attendance at evening technical schools. While still a teen, R.C. Mohler commenced a four-year apprenticeship as a machinist with the Baltimore and Ohio Railroad in Baltimore, Maryland. He rebuilt railcars and locomotives for one year following the completion of his on the job training. In 1907, Mr. Mohler relocated to Washington D.C. where he was employed at the Washington Navy Yard. By 1908, he had taken employment with the City of Washington D.C. in the water and sewer department. His salient task was to supervise the shop, which was responsible for the maintenance and repair of all pumps and boilers. It was doing his tenure in the national capitol that Mohler was loaned for several months in 1913, to the mechanical department of the Panama Canal to train machinists on heavy erection projects, including the installation of the Pedro Miguel lock on the “Big Ditch”. The Panama Canal opened for marine traffic in August 1914. In 1919, a newly wedded R.C. Mohler found employment with the Buffalo Forge Company. Here his first son, Bruce K. Mohler was born in December 1919. Mr. Mohler was general foreman and promoted to assistant shop superintendent. His duties included responsibility for factory output, power plant maintenance and general plant repairs and maintenance. In June 1921, Robert G. Mohler, “Big M”, arrived at Buffalo. Robert G. Mohler missed being a Texan by a few months as the family moved to Marshall, Texas from New York in 1922. Instead the honor went to Donald E. Mohler who could later celebrate his natal anniversary on April 23, 1924. In Texas, Mr. Mohler father was in charge of the locomotive and railcar shops of the Texas and Pacific Railroad. In addition as mechanical supervisor, the diesel and steam power plant were under his purview. With a yen for adventure, R.C. Mohler joined the Atlantic Gulf and Pacific Company at Manila, Philippine Islands in 1926. He would remain in the South Pacific until 1930, as in 1929 he took employment with the Honolulu Iron Works also in Manila. The Mohler’s first daughter, Marilyn J. Mohler was born here in March 1927. While in the Philippines, Mr. Mohler was involved with steam power plants; jetty cranes; logging machinery; sugar centrals; and railroads. It would appear that while on leave to the United States, the Mohler family discovered Ocean Springs, Mississippi for in January 1929, R.C. Mohler acquired about 25-acres of land north of Ocean Springs on Seaman Road. Three of the final children of R.C. and Albert K. Mohler, Richard, Stanley, and Shirley Ann Mohler, were born at Biloxi, Mississippi between 1930 and 1936. In 1931, Mr. R.C. Mohler left the tropical rain forests of the Philippine Islands for the dry deserts of Persia, now Iran. He was stationed at Ahwaz, Persia as mechanical and transportation superintendent of the Southern Persian Railways. Family archives have his contract with this organization, which carried a $6000 annual salary with an $800 travel stipend. This was an extraordinary income considering that America was mired in The Depression and millions were unemployed. At Ahwaz, Persia, Mr. Mohler superintended all shops, the diesel and steam power plant, and all construction equipment, which included: drag lines, wrecking cranes, jetty cranes, and oil and water pump stations. Upon leaving Persia in December 1932, R.C. Mohler was given a farewell party. In a family document from this event, his Persian staff lauded their chief as follows: During the period we have had the satisfaction of serving under you, you have always been a kind master and a friend to us, ever ready to help us and promote our interest, without in anyway slackening your practice of fairness and justice and your zealous consideration of the interest of the Persian Government. R.C. Mohler returned to his roots in 1934 and joined the Cumberland and Pennsylvania Railroad Company, which was headquartered at Mt. Savage, Maryland. The line, which only had 150 miles of track, operated almost exclusively in Allegany County, Maryland, and a portion of West Virginia and Pennsylvania. It was owned by the Consolidation Coal Company. Mr. Mohler had complete charge of all shops, and the diesel and steam power plant. 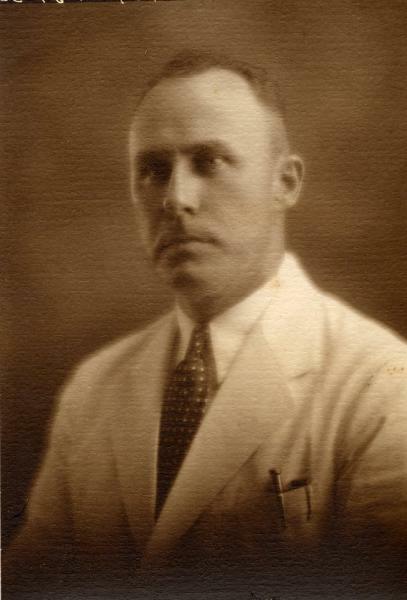 From Mohler family documents, it is known that in 1938, foreign shores called again and Robert C. Mohler continued his peripatetic career as a mechanical engineer. He and Mrs. Mohler departed America for the Union of South Africa where he contracted with the O’okiep Copper Company Ltd. at Nababeep, Northern Cape Province. Initially at Nababeep, Mohler was charged with the construction and erection of all mechanical equipment. Among the operations, which he supervised were: mining hoists and headgear; ore concentrators; the sulfuric acid plant and leaching plant; smelter; power plant; workshops; and a fully operational water systems equipped to function in a semi-arid environment. Because the O’okiep Copper Company facility at Nababeep was isolated from rail and seaports, it was vital that a highly functional workshop exist to maintain and repair all onsite machinery, motor vehicles, and light plants. Mohler had over one hundred vehicles to service and maintain. They ranged from motorcars to Mack trucks, semi-trailers, and trailers. When copper production commenced in 1941, Robert C. Mohler assumed complete control of the mechanical functions of the plant. The company smelter had an output of 2500-3000 tons of blister copper each month from about 100,000 tons of ore.
Bruce and Margaret M. Mohler were the parents of two sons born at Biloxi, Mississippi: Bruce K. Mohler Jr. (b. 1943) married Martha Howard and Donald Gerald Mohler (b. 1945) married Margaret A. Barbour Smith (b. 1947). 1950 Scott Field, Mississippi State College, now MSU. Inheriting some of his father’s peripatetic nature, Robert G. Mohler was awarded football scholarships to several Southeastern Conference schools. 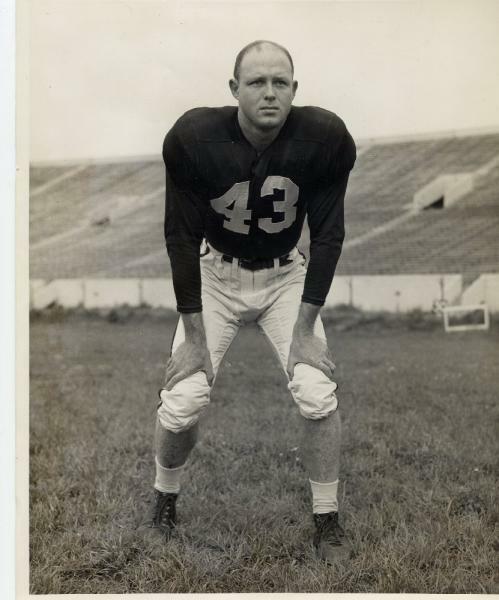 Circa 1946, after discharge from his Naval military service following WWII, he matriculated to the University of Tennessee on the first of his three football scholarships. General Robert R. Neyland (1892-1962) was the coach. Bob relates that one of the proudest moments of his life was being selected to play under the tutelage of the great General Neyland, a 1916 graduate of West Point. As most football aficionados know, General Neyland was one of the most successful teachers of the sport. During his tenure at Knoxville, he brought the Volunteers to the pinnacle of gridiron greatness. Neyland’s interrupted coaching career at Tennessee between 1926 and 1952, resulted in a record of 173 wins, 32 losses, and 12 ties. His 1951 Vols were National Champions, and he was enshrined in the Hall of Fame in 1956. General Neyland also instituted the Vol Radio Network with play by play broadcasting by Linsey Nelson. In 1962, The University of Tennessee dedicated their football stadium to General Neyland. It is the largest in the South with a seating capacity of 104,079 people. Bob Mohler when reminiscing about Coach Neyland remembers that he was an excellent teacher, disciplinarian, and a fanatic on the basics of the game-blocking and tackling. Neyland’s philosophy was that if a player could not skillfully block and tackle, he could not play the game for him. In early August 1946, Robert G. Mohler returned to Ocean Springs for a two-week vacation with the full intent to return to Knoxville in September. It was then that he determined that the distance to the Tennessee campus and the realization how long he had been gone during the war, that he wanted to be nearer friends and family. Bob requested a release from his Tennessee scholarship in order to join a team closer to Ocean Springs. Coach Neyland refused which deemed him to wait a year before he could play with another Southeastern Conference team. Not wishing to watch from the sidelines, Mohler headed to Perkinston Junior College to resume his gridiron career. In July 1947, Robert Mohler with his friend, Bernell Seymour (1922-1991) drove to Tuscaloosa, Alabama. Bob Mohler had decided to offer his athletic services to Harold D. “Red” Drew of the Crimson Tide and wanted a tryout for a football scholarship. Mohler had known Coach Drew when he was Robert’s commanding officer in pre-flight school at the University of Georgia in Athens. At this time, the flyboy schoolboys had a team that would beat the University of Georgia in scrimmage games. Bob Mohler was given a walk-on scholarship and practiced with the Alabama football squad until classes commenced in September. At this time, the team was given it physical examination. Bob had been injured while serving with the National Guard in North Louisiana. While unloading tent poles from a truck, one had accidentally perforated his left shoulder above the pectoral muscle. This wound eventually led to a deep infection in the clavicle region, which hospitalized him at Hot Springs for several months. Army doctors predicted that his promising baseball and football careers would never materialize because of the serious nature of the wound. Young Mohler was not deterred by their dire predictions. In the late evenings, he would go to the hospital gym and unknown to anyone, exercise his stiff and sewn pectoral muscle region. It became an unsolved mystery to Mohler’s physicians how his surgical stitches kept breaking! When the Alabama team physician observed Mohler’s wound, he became alarmed. His recommendation to Coach Drew was that Mohler should only be permitted to practice lightly until the shoulder was fully healed. At this point, Robert decided to leave Tuscaloosa. With the Tuscaloosa disappointment in rear view, Bob Mohler must have doubted if he would ever make it into the Southeastern Conference as a football player. Determined to succeed and confident of his abilities as a runner and punter, he went to Starkville to offer his services to Arthur W. “Slick” Morton, the Bull Dog mentor. Morton, an LSU graduate, came to State in 1949 and compiled an 8-18-1 record during his brief tenure at State College. Bob Mohler’s introduction to Coach Morton was difficult. Morton was obviously busy with pre-season drills and not particularly interested in interviewing a walk-on prospect. Finally, Mohler trapped him in his office and the coach relented. He told Bob to get a uniform from the trainer and be on the practice field that afternoon. In the dressing room, Mohler finally got a ragtag assortment of gear from the disinclined trainer. With an oversized helmet, which could rotate 360 degrees around his head, torn pants, and unfitted, high-top shoes, Bob Mohler was introduced to Bully football. His first test under Coach Morton was to return punts with several blockers to lead interference. When he sailed pass tacklers, Morton removed his interference and sent Robert without blockers against four streaking pursuers. Again, Mohler showed his mettle and avoided the tacklers with ease. Regardless of his talent and skill at the running back position, Slick Morton ignored Mohler. Bob was apparently doomed to ride the pine. It was assistant coach, Jesse Fatherree, a member of the 1935 SEC Champion LSU tiger football team, who saw the potential in Robert Mohler. Fatherree, himself a rusher of renown in the annals of LSU football chronicles, was All-SEC in 1935. Some highlights of his career were a 94-yard touchdown run against Georgia and a punt return of 100-yards. Coach Fatherree knew that Mohler’s speed would be invaluable to the defense and he made a cornerback out of the Ocean Springs flash. This move paid off in the Alabama game at Tuscaloosa in 1950, when Robert Mohler ran down the Alabama runner, Lawrence E. “Larry” Chiodetti (1931-1993), a former 220-yard dash state champion, before he reached the Bulldog goal. Mohler was on the opposite end of the line from where the play was run! Upon leaving the automobile business in Biloxi, Robert G. Mohler joined the Civil Service at Keesler Air Force Base in 1958. He remained here twenty-years teaching in the air traffic control facility prior to his 1978 retirement. With a growing family to support, Robert in1960 had started a Spud Nut franchise on the east side of Washington Avenue between Porter and Bowen in a Moran rental. The business moved north up Washington near Desoto into a building owned by Archie W. Tootle (1925-1975). Later Spud Nut became Tato Nut and is now situated at its familiar location on Government and Kotzum and has been managed by David “Camp” Mohler since 1980. Circa 2001, Jeff “Bitty” Mohler opened his BPI Fuel, a Shell Oil station, on the northeast corner of Mississippi Highway No. 57 and US Interstate No. 10. He also operates a deli here at this south Vancleave site. Circa 2007, Jeff opened another service station on the Ocean Springs-Vancleave Road near the Ocean Springs Hospital. Ms. Highway 57, Vancleave, Mississippi. Opened March 2004. 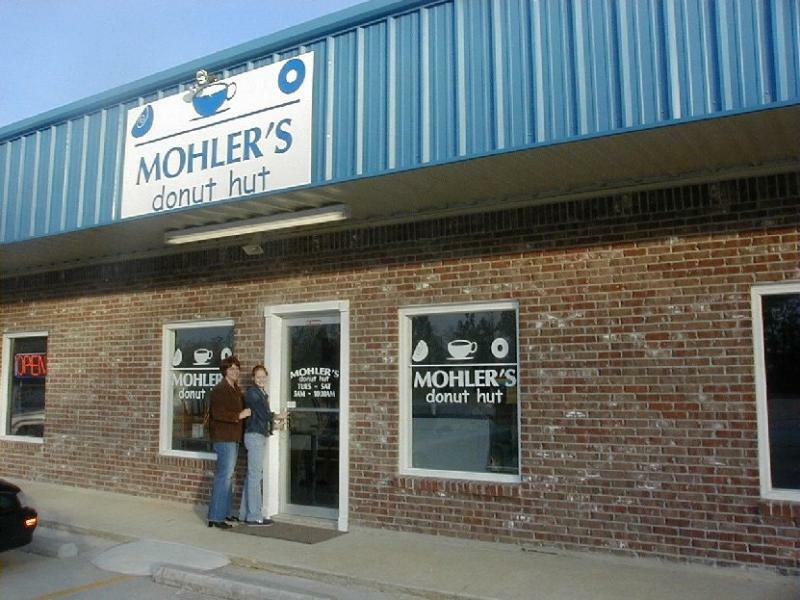 Recent developments by the industrious Mohler brothers are Mohler’s Filler Up in Ocean Springs and Mohler’s Donut Hut in Vancleave. Jeff “Bitty” Mohler opened his Filler Up on February 12, 2004, in the space formerly utilized by Mohler’s Auto Detailing. His menu features “Kathy’s breakfast items and a large selection of deli sandwiches and po-boys. The “Big M”, an old fashioned, ½ pound, hamburger like your mama used to make, is a bargain at $2.99. For the average appetite, there is the “JuJu”, a ¼ pound hamburger, and naturally very reasonably priced. In Vancleave, Jerry and Richard “Brick” Mohler are making final preparations to open Mohler’s Donut Hut on Mississippi Highway 57, adjacent to the Family Dollar Store. They anticipate opening their new venture in early March 2004. Donald Earl Mohler (1924-1989) was born April 23, 1924 at Marshall, Texas. He graduated from Ocean Springs High School with the Class of 1941. Donald married Marilee Boyd (d. 1989). They were childless. Donald E. Mohler was a career Army officer and retired at El Paso, Texas as a Lieutenant Colonel. He expired on July 28, 1989 at El Paso, Texas. Marilee B. Mohler passed on May 15, 1989, also at El Paso. No further information. Richard Herbert Mohler (b. 1930) was born at Biloxi, Mississippi on March 26, 1930. He attended the local public school and graduated with the Class of 1948. In high school, Richard played the fullback position with great skill for four years, as a member of the Greyhound eleven managed by Coaches Buckingham and Jones. He also excelled on the basketball court and was Band captain. Upon graduation, Richard H. Mohler was recognized as Mr. Ocean Springs High School, most popular boy, most likely to succeed, and salutatorian of his class. After high school, Richard H. Mohler enlisted in the US Army and served one-year active duty with the 5th Armored Division Band at Fort Chaffee, Arkansas. In September 1950, he was recalled to active duty during the Korean War and was honorably discharged from his military duties in September 1951. In 1951, Mohler matriculated to the University of Mississippi where he was awarded the UM Forest Lands academic scholarship. By August 1955, he had earned BA and MA degrees in Mathematics from Ole Miss. Mr. Mohler has completed post-Masters studies in higher mathematics at LSU and the University of Colorado. Today, Richard H. Mohler and spouse, Rita Dietlin Mohler (b. 1936), a native of Plymouth, Massachusetts resided in Fairfield, Ohio. Their daughter, Micheline Mariann Mohler King (b. 1970), a graduate of the University of Miami (Ohio), and her spouse and their two children are also domiciled in Fairfield. Shirley Ann Mohler (b. 1935) was born September 26, 1935 in Biloxi, Mississippi. After her sophomore year at Ocean Springs High School, she spent eighteen months with her parents in South Africa and finished her high school education through the American School program based in Chicago. Shirley attended a prep school in Massachusetts and the Latin American Institute in New York City before meeting her future husband, Leon J. “Jeff” Giafaglione (b. 1925), a native of New Orleans. They were married at the Mohler family home in May 1957. Shirley M. Giafaglione has worked as the secretary for the manager of the Ocean Springs State Bank and for sixteen years served as a youth court volunteer. Leon is a cabinetmaker and for many years was employed by Carroll Benton Ishee (1921-1982), Ocean Springs unique naturalist builder. Since 1970, Jeff and Shirley have worked summers under the auspices of the Methodist Church at its Redbird Mission in the coalfields of southeastern Kentucky. In 1961, before their children, Leon Bryan Giafaglione (b. 1963) and Perri Giafaglione (b. 1967), were born, Shirley and Jeff, both motorcyclists, embarked from Galveston, Texas for Europe, with their bike on the deck of a Lykes freighter. Three and one-half months later, the Giafagliones had toured thirteen countries and brought home experiences for a lifetime. Walter F. Fountain, Fontaine-Fountain, (Fountain: Biloxi, Mississippi-1987). The History of Jackson County, Mississippi, “Robert C. Miller”, (Jackson County Genealogical Society: Pascagoula, Mississippi-1989). Charles Clyde Moler, Mohler-Moler Genealogy, (Hagerstown, Maryland-1954). Chancery Court Jackson County, Mississippi Chancery Court Cause No. P-4036, “The Estate of Alberta Ellen Mohler”, November 1993. The Daily Herald, “Ocean Springs”, September 1, 1930. The Daily Herald, “Marilyn Mohler Dies”, December 1, 1941. The Daily Herald, “Perkinston Invades Moorhead for Grid Opener Friday Night”, September 19, 1946, p. 7. The Daily Herald, “Mohler funeral Tuesday morning”, November 29, 1948. The Daily Herald, “Bruce Mohler buried”, December 1, 1948. The Jackson County Times, “Standard Oil Co. Starts Work On New Station”, February 13, 1926. The Jackson County Times, “Sgt. Mohler Buried Here”, December 3, 1948. The Mississippi Press, “Your Neighbor-Robert Mohler”, January 23, 2002. The Ocean Springs News, “Robert C. Mohler”, October 18, 1962. The Ocean Springs Record, “Business provides shiny investment”, July 29, 1982, p. 13. The Ocean Springs Record, “Mohler’s goes independent”, March 5, 1992, p. 1. The Ocean Springs Record, “Alberta E. Mohler”, October 8, 1992. The Sun Herald, “Service With a Smile”, August 24, 1999, p. c-1. Robert G. Mohler, February 2, 2004.